Over the last year, I’ve launched two new businesses in addition to running this blog. Juggling three separate ventures isn’t easy but I have a few simple tips to make the process smoother if you find yourself in a similar position! Before I expanded my business ventures, I sat down with my accountant and asked him how I should structure my books. The thought of potentially keeping track of receipts and accounts across multiple businesses made my head spin! He suggested that I form one LLC (Limited Liability Corporation) and then create a DBA (which stands for “doing business as”) for all of my additional ventures. I took his advice and formed a business under my name, Shauna Haider LLC and then created a DBA for Branch and another for Nubby Twiglet. Since all are housed under my LLC, I now keep one set of books when it comes to taxes. Because I am now running two blogs, it’s important for me to keep track of what to post and when to post it. I am constantly dreaming up new ideas and producing content and in the back of my mind, I’m always thinking about which blog it is most appropriate for. Nubby Twiglet is my personal outlet with content revolving around design and lifestyle topics. Posts relating to personal style, home improvement, travel and advice live here. On the other hand, the Branch blog is a place for my studio to post business-related content as well as design projects. I keep detailed editorial calendars with outlines for the next month’s worth of content for each blog as a safety net (though it often shifts for the day depending on my mood). Having that arsenal of ideas scribbled down keeps me from feeling like I’m posting on the fly and in turn, producing sub-par content. Part of the reason I’m able to stay on top of multiple businesses is because I batch process a lot of smaller tasks. For blog posts, I’ll often shoot all of the images I need for the week over a few hour block of time on the weekend and set up folders on my desktop for each. When it comes to my design business, if I’m working with multiple new clients at the same time, I’ll do visual research for both at once and produce any similarly formatted presentations on the same day. By mentally focusing on the same steps, I’m able to work much faster. All of my personal accounts including savings and checking as well as my credit card and home mortgage are issued through the same bank. When I set up my business accounts, I made an appointment at my bank and had a separate set of accounts opened but had them linked in with the others. Now, I can log into my account online and see all of my balances across six accounts at the same time. I’ve always had difficulty with delegating tasks. I tend to think that I can do it all (and do it well) but I’ve had to learn the hard way that this isn’t always the case. Over the last year, I’ve gotten better at letting go. Joey now does all of our grocery shopping and runs most of our household errands so I can spend more time focused on work. A month ago, I hired my mom as the project manager for Branch. Just knowing that she’s taking care of all of my business correspondence gives me peace of mind. These five changes have saved me so much time and helped my sanity tremendously! 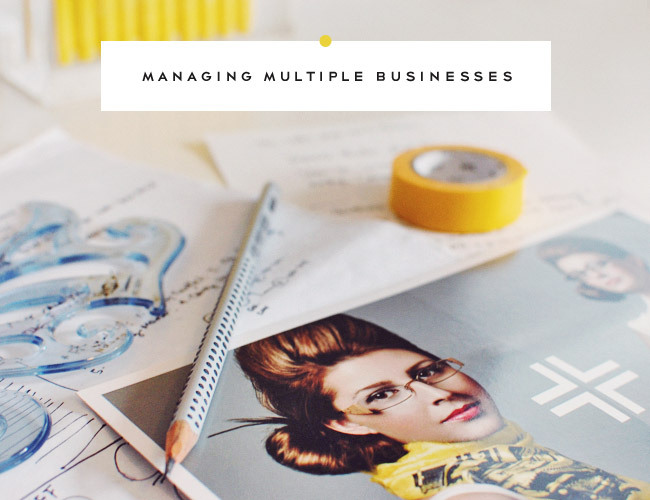 Do you have any more tips you’d recommend to make running multiple businesses even easier?